Therefore, for every identified lease, companies will be required to create a lease liability calculated as the present value of the future fixed payments and a corresponding asset (“right of use” asset). The right of use asset will be amortized over the life of the lease. The income statement will be impacted by a straight-line lease expense item that would essentially contain an interest component with the amortization of the asset being the plug-in order to achieve straight line lease expense over the life of the lease. Since companies were not required to capitalize leases in the past, record keeping for leases were often decentralized. Most companies did not ever require operating leases to go through a formal capital committee review. This meant record keeping and leasing terms were often undocumented. The leasing related companies often transfer(sell) existing leases in their portfolio to other leasing companies making it even more difficult to track down leases. The new standard is forcing companies to go through the process of locating all their operating leases. For many firms this is an onerous task as some leases are decentralized and managed by their subsidiaries. The following is a course of action to gather all the leases for an entity for ASC 842 accounting determination. 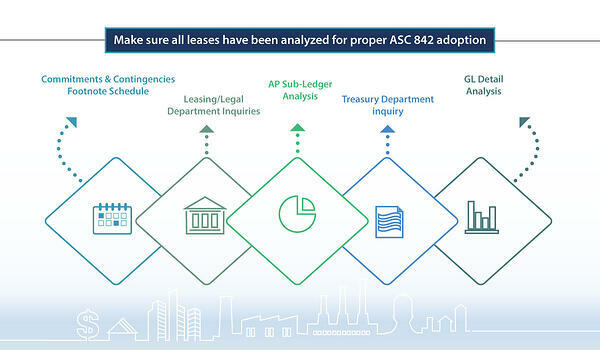 These five required steps to completeness and determination will help make sure that all leases have been analyzed for proper ASC 842 adoption. Even though companies were not required to account for their operating leases on their balance sheet under ASC 840, there were required footnote disclosures. The operating leases for future periods were disclosed in the “Commitments and Contingencies” section of their 10-K filings. This disclosure would serve as a starting basis for all active operating leases. The footnote would most likely contain a schedule of all future annual lease payments, lease terms, and minimum required lease payments. This schedule would be the beginning basis for the master lease schedule. Some very large or lease centric companies have a Leasing department. The Leasing department would likely have a listing of all approved leasing companies and all related contact information. The Leasing department would be the starting point of all lease negotiations and final lease execution. 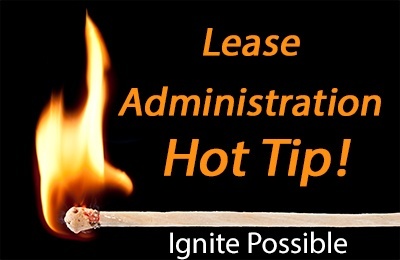 Inquire with leasing management as to their current active lease files. This population of leases discovered in your initial inquiry of leasing management should detect leases not included in the “Commitments and Contingencies” footnote disclosure. The Legal department is also a key contact regarding leases(and contracts) to make a formal inquiry. The Legal department reviews, negotiates, and approves all legal documents. The Legal department would keep a repository of all approved and executed legal documents. Access to this contract repository will aid in the detection of “embedded leases”. Embedded leases are leases under ASC 842 that are within a services contract not currently accounted for as an operating lease and therefore not included in the “Commitments and Contingencies” footnote. As the company continues to navigate ASC 842 adoption, for completeness purposes, all payments in the AP sub-ledger in the trailing twelve months should be reviewed. These payment records should be reviewed in detailed for any vouchers that might relate to a lease and was not present in the 10-K or the Leasing/Legal department contract files. Companies should query their detailed AP data for key words such as “lease”, “rent”, “building”, “equipment” and the like. It would also be prudent to query the AP data for the entity’s common lease related vendors. The leasing company vendor list would have been provided by Leasing management or AP management. All leases detected through the AP sub-ledger should be matched against the list derived from the prior lease detection efforts. All unmatched leases should be added to the original list to continue building the master lease schedule. The next step in the AP analysis is reviewing payment files for any monthly recurring payments. Trace these recurring payments to the AP voucher and compare to the master lease schedule. Any voucher that is recurring and not already included on the master lease schedule would require further analysis to determine if it is indeed a lease. If the payment relates to a service contract, review the contract in the files of the Legal department, as discussed earlier to determine if there is an embedded lease. Next, a detailed listing from the general ledger for the rent expense account(s) should be examined and compared against the list derived from the all the previous lease detection efforts. This is to detect payments or reclasses that are lease related but outside the AP sub-ledger. This process may reveal wire transfers related to a lease or transactions that are lease related but not detected by the prior lease detection steps. A detailed listing of the general ledger for property tax and insurance expense should also be examined and compared against the data derived from the previous inquiries. This listing may detect property taxes and insurance expense for net leases not otherwise accounted for in the prior steps. All wire transfer payments should be reviewed for any payments that might relate to a lease. Treasury departments routinely wire transfer large rent payments, especially related to leased real estate due to the exorbitant late fees charged in standard rental agreements. It would also be prudent to review the operating bank statement for wire transfers posting towards the end of the month that might relate to a lease. These wire transfers can be traced back to the wire transfer request documentation to determine if the payment is lease related. As companies move through these steps to finalize their entire lease population, it is advisable to return to the Leasing and Legal department with the leases discovered that were not included in their original Leasing and Legal department inquiry. This will allow these departments to update their corporate files and better manage the lease administration process. The Leasing Department in collaboration with the Corporate Accounting department, may want to consider having a central repository software program for all the company’s leases, terms, minimum required lease payments, etc. This will aid the Accounting department on a going forward basis as all new leases will be required to be analyzed for proper ASC 842 lease adherence. It will also allow for much stronger internal controls surrounding the leasing environment, and consequently, more accurate financial reporting.